The Nawroz celebrations proceeded peacefully in the disputed territories of Iraq. Despite fears of tensions in some areas including Kirkuk, people celebrated the event together with bonfires and folk dance. In the Ninewa Plains, all the diverse communities participated in the Nawroz fastivals. Ayhan Ali wore Kurdish traditional clothes and spent the eve of Nawroz on Wednesday March 20 at the Kirkuk citadel where he attended the traditional bonfire lighting ceremony with his friends, although there were fears of possible outbreak of tension. “Overall, the celebrations went briefly and without any complications. Security forces handled the situation in a professional way”, said Ayhan. Kirkuk administration decided that the celebrations at the citadel should not last for more than two hours to avoid any possible problems. Ayhan and his friends’ fear grew after the Turkmen Front and the Arab Council in Kirkuk declared that they will celebrate the start of spring at the same time and the same place which the Kurds were holding the Nawroz festivals. Qasim Qazanchi, head of the Turkmen Front’s branch in Kirkuk said the front decided not to go to the citadel to avoid possible skirmishes. Nevertheless, many Arab and Turkmen citizens joined the Kurds at the site of the festivals. On March 20, the eve of Nawroz, Kurds celebrate by wearing traditional clothes and lighting bonfires. It also coincides with the day Kurdish Peshmarga forces controlled Kirkuk after driving out the former Ba’ath regime from the city in 1991. “I am so happy that we all together light the Nawroz bonfire at the citadel wearing Kurdish traditional clothes”, said Bawan Saywan another female participant. Meanwhile the Nawroz celebrations were more joyful in The Ninewa Plains and Shingal (Sinjar) as the diverse components of these areas took part in the event. The town is home for a mixed make-up of Christians, Shabak and Ezidi communities. “For this year’s events we designated Bozan village where all the different components participated in the Nawroz festivals”, said Lara Yousif. This year, Nawroz, the Kurdish New Year was also celebrated other disputed territories, including Khanaqin and Duz Khurmatu. 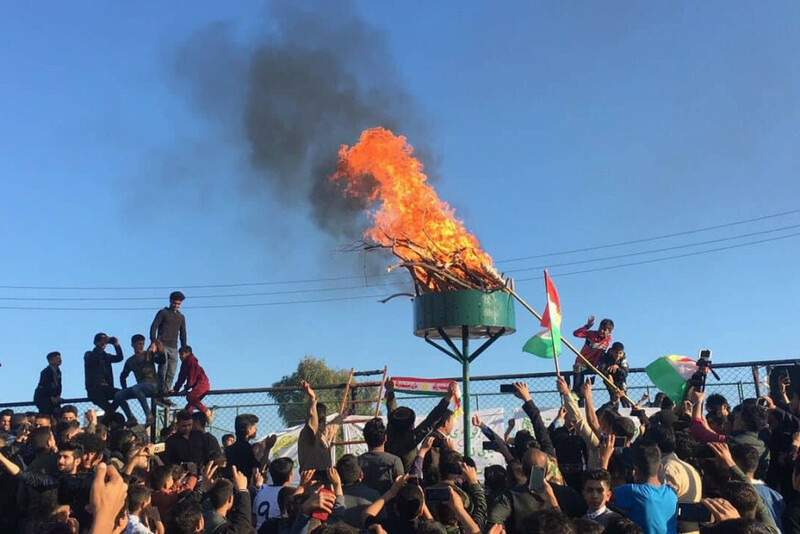 In Salahaddin’s Duz Khurmatu district the Nawroz bonfire was lit at the Hawkari Park, however the district council prohibited the hoisting of the Kurdistan Region flag during the festivals. In Khanaqin a range of activities to mark the day were held in two locations in central Diyala’s northeastern town of Khanaqin.